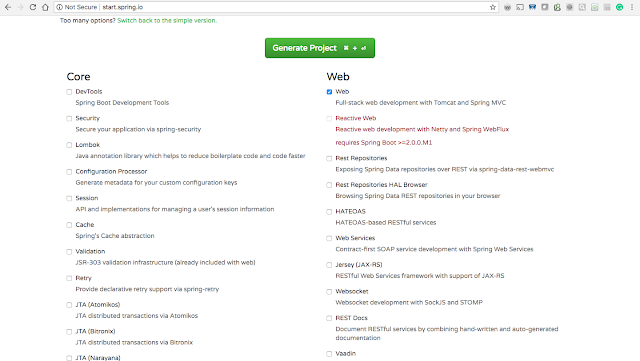 If you have used Spring framework previously, you must be aware that it takes some genuine effort to even get started with basic Spring functionality. With Spring Boot, that initial hassle is gone and you can get started in minutes. Welcome to the world of Spring Boot!!! In this tutorial, we will see How we can create a Spring Boot Project with the help of the Spring Boot Initializer. But there are options to Generate a <Gradle Project> with <Kotlin>/<Groovy> and Sprig Boot<Lower versions> as well as per our requirements. In this tutorial, we will focus on Maven with Java and Spring Boot 1.5.10. As we are creating a Maven project and we know that every Maven project has group and artifact id, so this interface provides us with placeholders where we can enter group and artifact id. 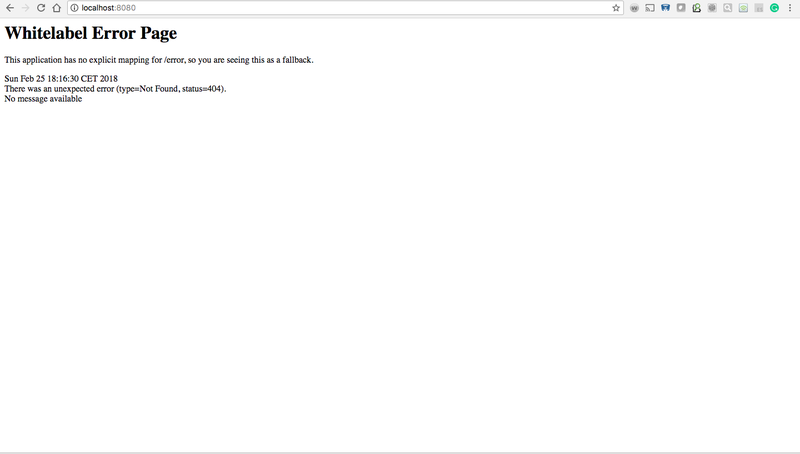 Click on the "switch to the full version" hyperlink, which is just below Generate Project button. Description: This is simply the description of the project.You can change it as suitable but it does not make difference from the technical front. Package Name: This is a name of the package that will be created by Spring by default when Spring boot project will be created using this GUI of start.spring.io. We are going with Jar option. As of writing this tutorial, we have three options 7,8 and 9.I will go with the default which is Java 8. Scroll down on the start.spring.io web page and you will find below a list of dependencies which you can add in your application depending upon the requirements.Here we will add only Web dependency.For that, you just need to tick that dependency and once you will click on Generate Project, this dependency will be added to the generated project. Click on Generate Project and you will see that project will be downloaded and Zip on your hard drive with the name which you would have given in Artifact text box. Extract project using WinZip and import in Eclipse as Maven Project by right clicking in Package Explorer and then select import... -> Existing Maven project ->Next -> Chose extracted project from the hard drive -> Click Finish. 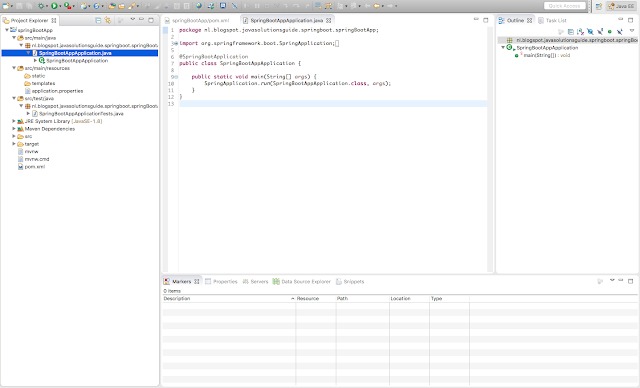 You will see a java project as per Maven standard is there in eclipse.And with this, you have already set up a Spring Boot project in Eclipse.Easy.... right. Let's explore the project that has been created. 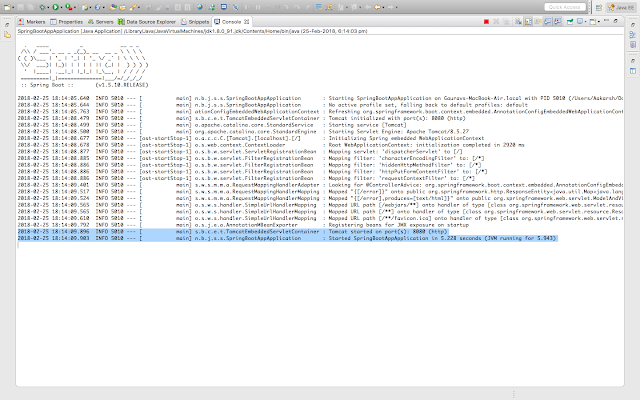 - Following parent has also been added automagically(note the word, it is Spring Boot's magic :)). It will make sure that following Maven dependencies are added to the project.You can try removing spring-boot-starter-parent from pom.xml and save the project and you will notice that all your following dependencies will be gone. 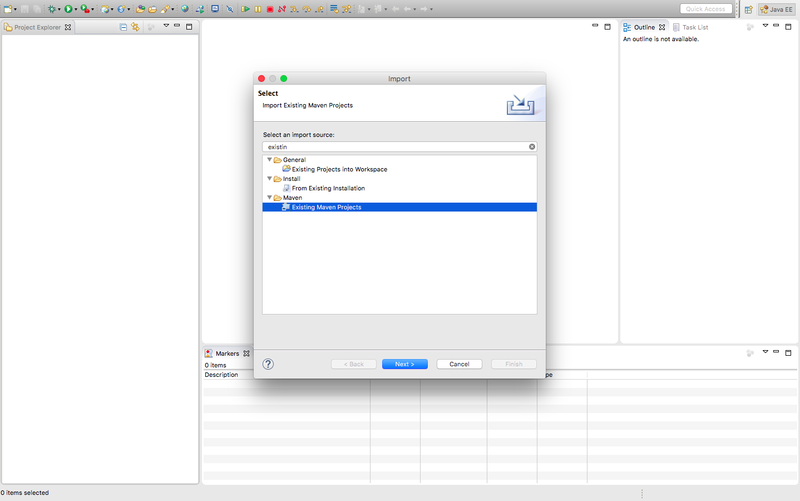 - In above list of dependencies, you must have noticed that spring boot has also added dependencies for embedded Tomcat so that you need not to install or configure tomcat in your eclipse explicitly. 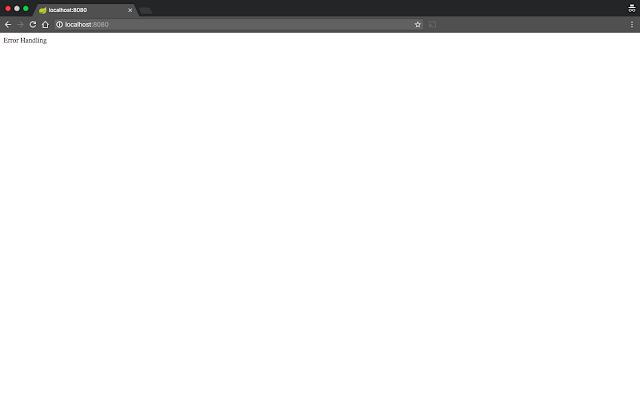 - Also, you will find following properties, dependencies and plugin added automagically.Remember that as we selected Web in start.spring.io GUI,dependency spring-boot-starter-web has been added in POM file. - If you open src/main/java, you will see that package which we mentioned in start.spring.io GUI has been created, which is "nl.blogspot.javasolutionsguide.springboot.springBootApp"
- Within the above-mentioned package, you will find a class SpringBootAppApplication.So basically a class with the name as <Name of your Project> with "Application" word appended to it is created in the specified package. We will discuss more on these annotations in subsequent tutorials. - From the main method of SpringBootAppApplication ,SpringApplicaiton class's run method is called. 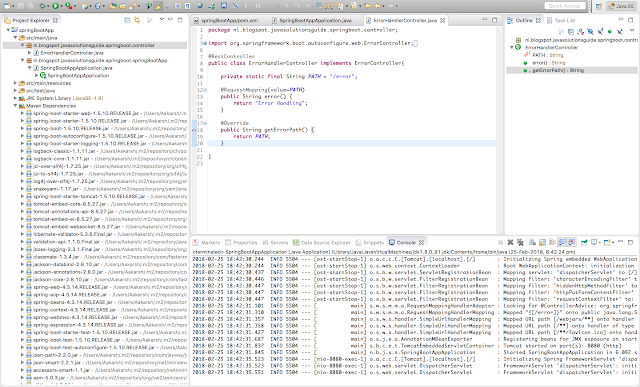 This method makes sure that Spring application's applicationContext(the Spring Container) is initialized. 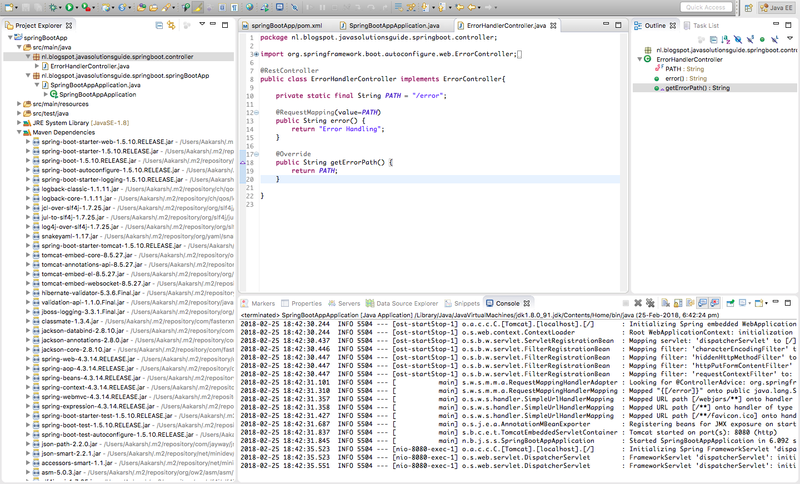 Spring boot uses AnnotaionConfigApplicationContext. 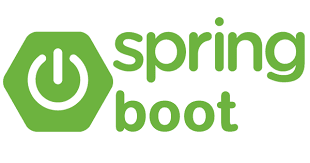 Run the main method of SpringBootAppApplication and you will notice that jar is automatically deployed to embedded Tomcat server and Tomcat server has been started at port 8080. 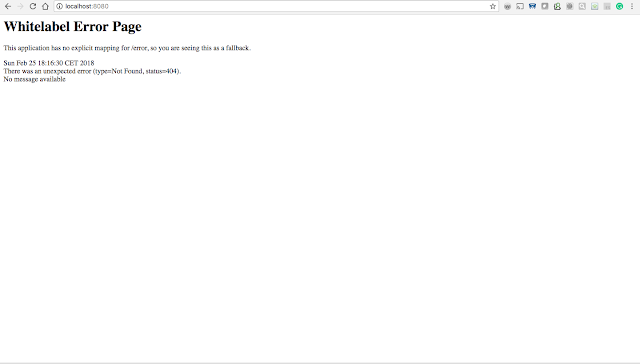 Now as our code is deployed on Tomcat and Tomcat is up and running, Let us try to hit 8080.
oh...Error Page and it says that "This application has no explicit mapping for /error, so you are seeing this as a fallback." Please note that this controller needs to implement ErrorController interface which is provided by Spring Boot and we need to implement it's getErrorPath() method. Also as I told earlier @SpringBootApplication already include @EnableAutoConfiguration, that means that we don't need to do all configurations which otherwise we would have to do to handle request via Rest controller like configuring DispatcherServlet. Similarly, we can have n number of controllers as per our requirements in our project and can handle the request and send valid responses back to a web page. 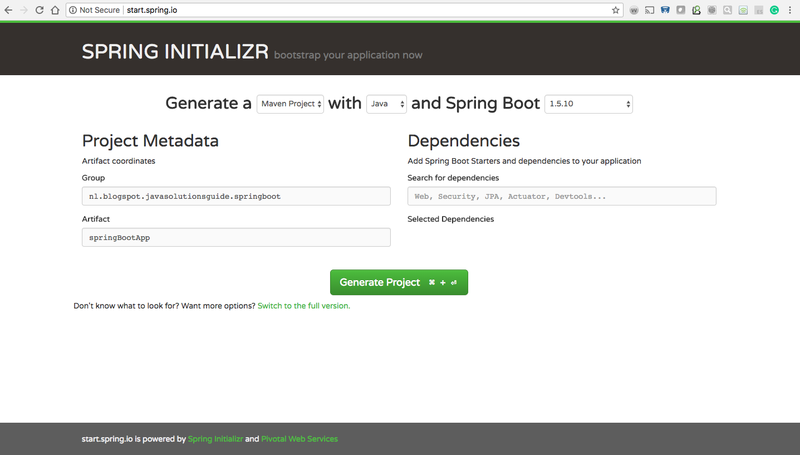 That's all Friends on How to create Spring Boot project with Spring Initializer. 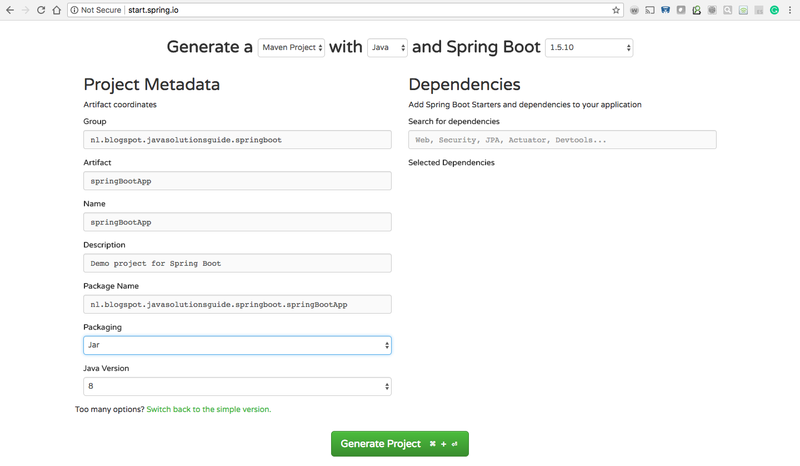 In subsequent tutorials, we will go through other ways to create Spring boot project. Subscribe for getting next tutorials right in your mailbox. Thanks for reading. If you liked it , support me by liking our Facebook page and sharing this post.